DONATE...VOLUNTEER...SHOP ...DINET is a non-profit, 501C3, all volunteer organization. That means that we are completely dependent on the generosity of the people who use the site or find what we do valuable. Read the "Why Donate?" section below to get an idea of just a few things we do to support and advance the DINET community and dysautonomia. But we need support to continue to do what we do. So we ask people to give something back throughout the course of the year. It could be donating your time in some way by volunteering or making a donation yourself or fundraising for DINET. There are many, many ways to help DINET keep going and providing the support and information that patients and caregivers need. If you would like to volunteer, there are details about the process and opportunities on our Volunteer page For the many ways you can make a direct donation or enroll in programs that encourage companies to donate to DINET, please see below. You can also help dysautonomia awareness by requesting printed materials or downloading information from the site to give to family and friends and even to your doctors who may not know as much as you do about this disorder. Every time you educate another person and make the word "dysautonomia" a condition they understand, you are helping patients and families who are struggling to understand the changes in their lives. And if you educate a medical practice, you may be helping someone else get diagnosed in half the time it took for you. If you have any questions about volunteering or for more information about making a donation or would like to receive educational materials, please contact webmaster@dinet.org Thank you so much for wanting to help. There is a fit for everyone. 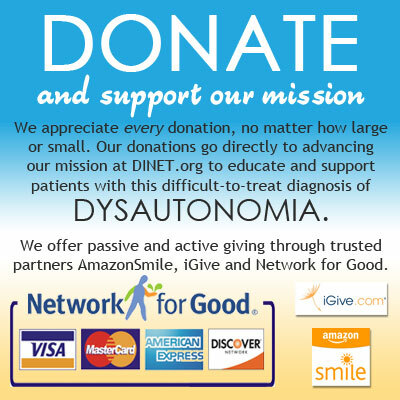 DINET is a 501(c)(3) nonprofit organization created and maintained by volunteers living with dysautonomia. Together, we can fight dysautonomia. The Dysautonomia Information Network (DINET) provides support to patients and caregivers living with dysautonomia. We are also raising awareness of autonomic nervous system dysfunction and promoting education for the medical community and patients. We are participating CHAMPIONS of the All of Us Research project recently launched by the National Institute of Health and the Rare Disease Network. The project is working towards the enrollment of 1 million participants to advance Precision Medicine and enable Dysautonomia Researchers to have a database of patient information at their fingertips. We have just completed the first phase of a member survey about the impact age has on dysautonomia symptoms, treatment, and diagnosis. Our site is continually updated with new research projects and news about dysautonomia and related illnesses and disorders. Our forum members are thousands strong and sharing daily about the struggles, accomplishments, treatments, and support inherent in living with dysautonomia. Our Facebook page is updated daily with information about living with chronic illness and important information about prescription meds, new treatments, and research. Our newsletters are being distributed to thousands of people across multiple platforms. We are beginning a series of information videos for DINET's YouTube Channel and invite members to participate with their own videos. We have produced info packets about living with dysautonomia. They are for specific audiences so the information is focused on the issues most important to that audience. We have participated in multiple outreach events across the U.S. and plan to roll out our first Facebook Live event this October. We will be expanding our outreach to medical practices further in the U.S. and internationally. Our plan to translate key pages will assist us in reaching out to patients in non-English speaking countries as well. We have started that outreach through our Facebook page with translations of our daily posts, wherever possible. No donation is too small and every donation is greatly needed and appreciated. Please choose the way that best suits you from the options below. Many thanks and appreciation from all of us. If you donate on DINET's page through the PayPal Giving Fund , PayPal forfeits all fees so 100% of your donation goes directly to DINET. You can choose to donate whatever amount you want. And why stop at your birthday? Ask for donations in lieu of gifts for holidays and special occasions. Do you feel uncomfortable when people ask you what you want for your birthday, Christmas, etc.? Instead of giving an awkward answer, let them know that you would really appreciate a donation to DINET! You could even formally request donations to DINET on invitations and gift registries. Share our page links on Network for Good or the PayPal Giving Fund link to make the donation as easy as possible. If you are the artsy type AND a do-gooder consider donating a portion of the sales from your Etsy Shop! You could also make Dysautonomia-themed products that include our teal awareness ribbon, supportive messages or products that could be used by those with Dysautonomia. If you would like to use DINET's name or logo on any products you are creating, please be sure to get in touch with us first. You can email webmaster@dinet.org Go to https://www.etsy.com/help/article/4528 for more information about how to donate some proceeds from your shop. In order for your purchase to get credited to DINET, you must have started your purchase process via the iGive website. Even if you shop online only once, your donation will be added to those of every other DINET supporter. If you're going to shop online anyway, it's the easiest donation you'll ever make! If you have questions about the iGive service, please see the "Frequently Asked Questions" link on their site: http://www.igive.com/html/sitemap.cfm Once the link opens, go to the section marked "Tools for You" and then open the link labeled "FAQ". Become an Everyday Hero by organizing your own charity event! No event is too big or too small. In fact, we think these events are pretty AWESOME because they spread awareness about DINET while also raising funds to support those living with it. You could host a charity walk, bake sale or yard sale. We would love to see how you put your creative talents to use! Visit everydayhero.com to get started. Like, comment and share our posts as much as possible! YOU are the ones that get our messages heard. Join the DINET Community. Click the Sign up button on our home page. Last, but definitely not least, volunteer with DINET! Occasionally, we have openings for long-term volunteers, but STILL VOLUNTEER if you don't think you can make that kind of commitment! Join our Special Projects Team to volunteer on an as-needed basis. We will contact you when we have a project you may be interested in! Check available volunteer positions at https://www.dinet.org/get-involved/volunteer/ Email webmaster@dinet.org even if you don t see a position you want. We have new projects arise all of the time! Share your ideas and time! **DINET is a 501(c)(3) organization. Donations are tax deductible according to IRS regulations.